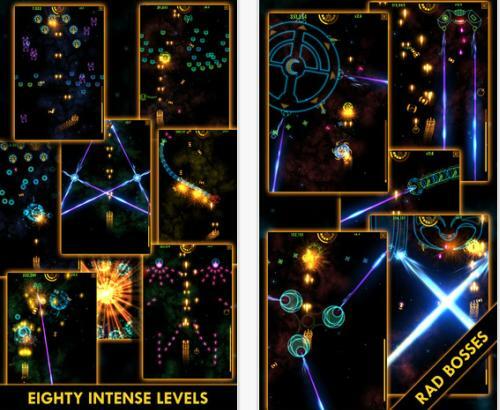 There are a huge variety of different games available for mobile devices and retro type space shooters are extremely popular, and today we have news of a recently released game called Plasma-Sky for iOS that has seen a price cut for the weekend. This new game is also available for Android users to enjoy but the iOS version has seen a fifty percent price cut for the weekend, and Plasma Sky features a massive eighty levels to test your shooting skills. The game may be easy to begin with but as you progress things get a little more testing, as a single finger guides your ship with firing being taken care of automatically. There are a number of different game modes to enjoy as well as plenty of enemy space ships to destroy along the way. You will also find plenty of power ups and the game is universal with none of those pesky in app purchases getting in the way. Your ship has a regular shield along with a spike shield so you can ram the enemies along the way, and you also find numerous bosses to do battle with. Players get a wing man that can also power up with both of you having powerful lasers needed to destroy all your enemies. Users that have already been enjoying Plasma Sky already have given the game really positive reviews, with it currently priced at Â£0.69/$0.99 on the App Store, and check out the demo video below.